On third party websites like Google, Yelp, Facebook, etc. …Both places are equally important, because all of your potential customers don’t visit Google, Yelp and Facebook BEFORE coming to your website. Direct traffic is from potential customers that find your website by entering it directly into the address bar or even through a bookmark. Referral traffic is from potential customers who find your website through emails and even on third party sites such blogs, etc. Paid traffic (or PPC) is from potential customers that find your website after clicking on a paid ad on places like Google, Bing, Yahoo and Facebook. All pages of your website…yep all pages of your website…because a review mind as well not exist if nobody sees it! 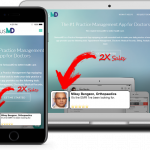 Sticky Reviews are displayed on all pages of your website and display on desktops, laptops and even mobile devices – for all of your potential customers to see. Turn your regular reviews into Sticky Reviews and get more sales without spending more money on ads! ==> Click here to start your FREE 14 Day Trial today!